Price in India of Nokia 6, HMD Global’s best-specced Android smartphone till date, has been leaked ahead of the official launch in less than an hour. According to a Twitter user who tipped Gadgets 360, the Nokia 6 will come with a price tag of Rs. 14,999, and will be available via Amazon India. 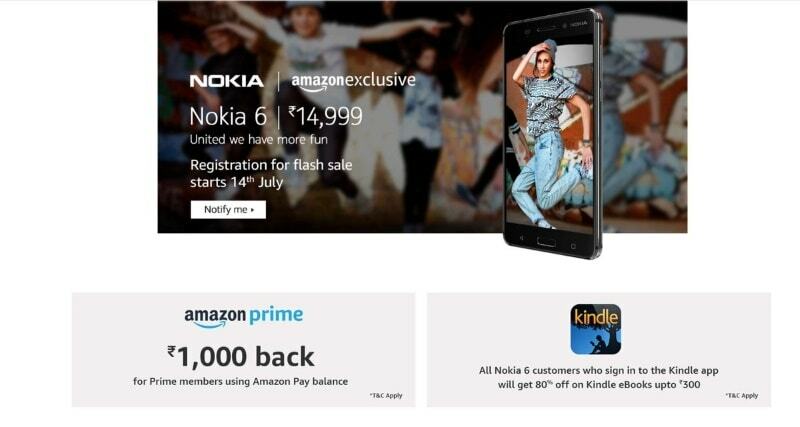 At this moment, it isn’t clear whether the Nokia 6 will be an Amazon India exclusive smartphone or will be available via offline channels as well. We should hear a confirmation from the company pretty soon. Nokia 6 is one of three Android smartphones that will be unveiled in India today. Nokia 5 and Nokia 3 complete the trio, with the launch coming weeks after the Nokia 3310 (2017) was launched in India carrying a price tag of Rs. 3,310. Nokia 6 sports a 5.5-inch full-HD display with a 2.5D Gorilla Glass on top. It is powered by a Snapdragon 430 SoC coupled with 3GB of RAM and 32GB of internal storage. The dual-SIM Nokia 6 smartphone comes with a 3000mAh non-removable battery with fast-charging support. As of now, there’s no word whether the Nokia 6 Arte Black will be also announced at today’s India launch. To recall, the Nokia 6 Arte Black is the premium variant of the smartphone. While it shares much of the features and hardware with the standard model, it comes with 64GB internal storage and 4GB RAM as standard. The smartphone’s USP, however, is its glossy black body that offers a more premium look compared to the standard model. Nokia 5 comes with a 5.2-inch HD display, and Android 7.1.1 Nougat. The Nokia 5 is powered by the Snapdragon 430 processor coupled with 2GB of RAM, and comes with 16GB inbuilt storage. It also supports expandable storage via microSD card (up to 128GB). Nokia 5 packs a 13-megapixel sensor on the back and an 8-megapixel sensor at the front. Nokia comes with a polycarbonate body and metallic frame on the sides. For specifications, the Nokia 5 features a 5-inch HD display, Android 7.0 Nougat, 1.3GHz quad-core MediaTek 6737 SoC, 16GB storage, up to 128GB microSD card support, 2650mAh battery, and 8-megapixel cameras on the front and back.